ClampArt is proud to present “Luke Smalley (1955-2009) | Exercise at Home” in celebration of the 10th-year anniversary of the creation of the body of work. This is the artist’s third solo show at the gallery. Luke Smalley’s work has been described as pairing “a coolly minimalist aesthetic with a retro nostalgia.” Many of his images were inspired by yearbooks and fitness manuals from the beginning of the 20th century. After completing a degree at Pepperdine University—tellingly, in sports medicine—Smalley became increasingly interested in fine art (while earning money from modeling and working as a personal trainer). 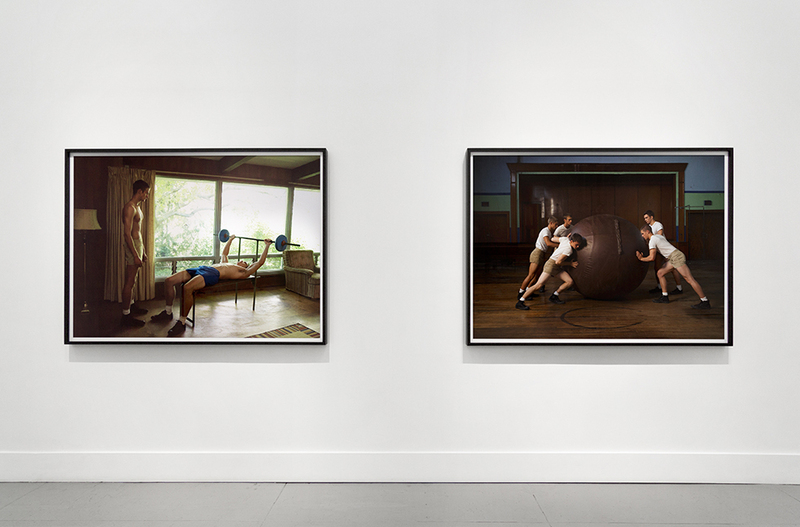 He spent fifteen years completing his first body of work, “Gymnasium”—a series of black-and-white gelatin silver prints depicting young, male athletes set in an ambiguous time and place. The subjects of the photographs were all local high school students from the small Pennsylvania town where the artist was raised. 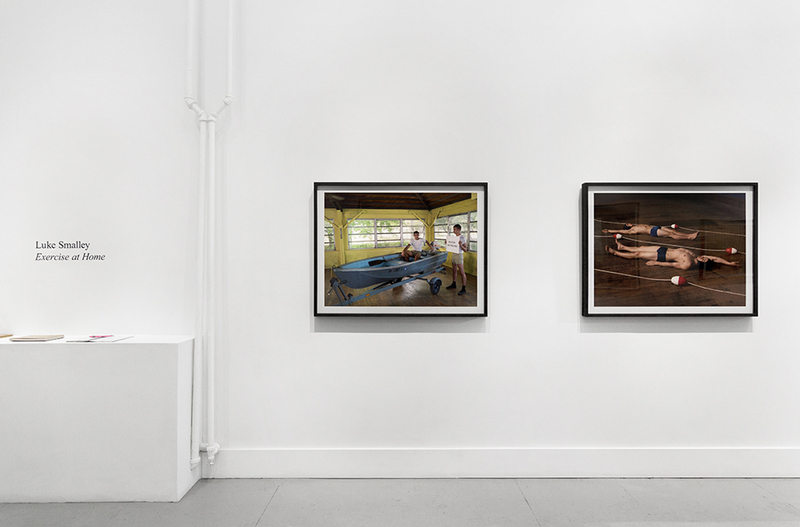 “Exercise at Home,” which was premiered in exhibitions on both the East and West Coasts in 2008, coincided with the release of a second Twin Palms publication—the artist’s third book. 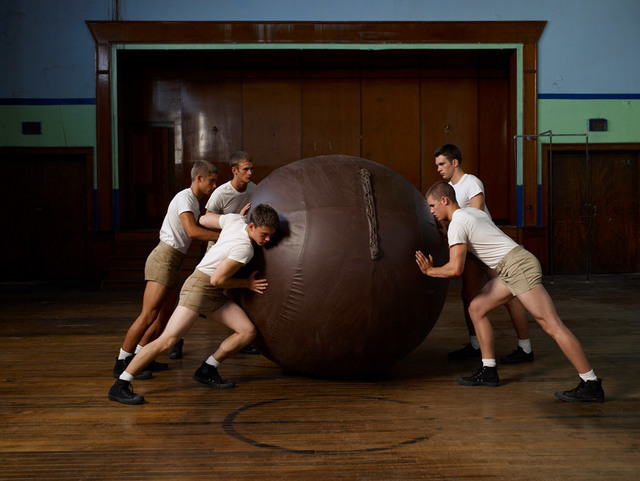 This marked the artist’s initial foray into color, but followed “Gymnasium” in its themes of “adolescent growing pains acted out under the guise of earnest athleticism.” Teenagers compete in simple but strange competitions in order to establish their standing within the group. 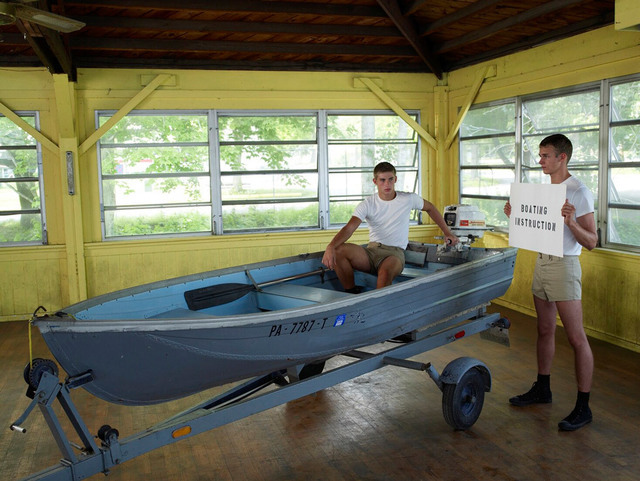 Two youths practice boating safety procedures on a small craft that happens to be indoors. Another pair have a psychological game of tug of war. And yet other boys practice swimming strokes on a gymnasium floor. 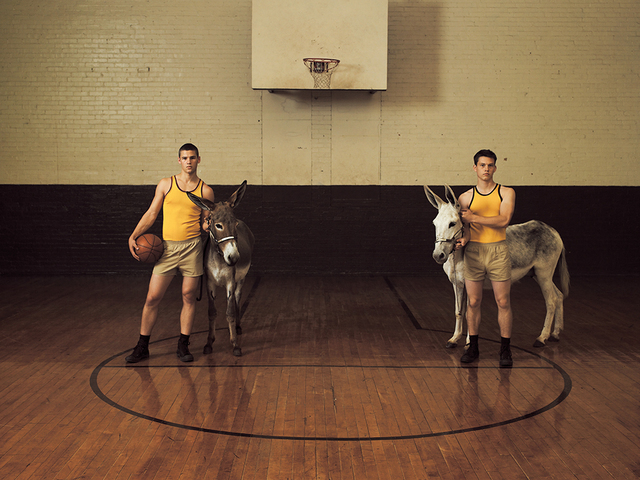 As with the previous black-and-white series, Smalley painstakingly coordinated the creation of the work to the extent of constructing his own athletic equipment and other props, in addition to simple costumes. It was now Smalley’s intent to continue publishing artist books in small editions every few years, which could then be coordinated with gallery exhibitions of photographic prints, thus augmenting his ongoing commercial career. Sadly, only one more project and monograph were realized before the artist’s death the following year.